At Camping Les Tourelles you may rent a mobile home -fully equipped, with two bedrooms, bathroom with shower, toilet and kitchen. Available all year round on a weekly basis ( Saturday - Saturday). This ensures a great summer holiday, but also the possibility of a week or two of fabulous winter sports. The ski resort of Les Orres is 15 km away! 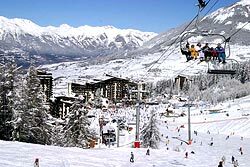 The ski area Les Orres located in the Hautes Alpes is one of the most southern ski areas in the Alps. This southern location is quite a distance from the Netherlands but provides considerable advantages. The sun shines three hundred days a year and the snow is thick on the slopes from Christmas time until Easter. The domain consists of 100 km of slopes and 40 km of cross country trails and has 19 ski lifts - mainly drag and chair lifts. The slopes are located on the northwest side of the slope, so the snow conditions are generally very good. 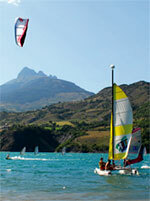 There are many red and blue slopes - not too difficult and very nice for families. About half of the area is covered with forest a real family destination! The ski resort does everything possible to make your holiday attractive. You may ski from the village and there are discount prices for families and there are many things organised by the ski school for the children. You may also go by bus from Embrun to Les Orres if driving in the snowy mountains is too awesome! !